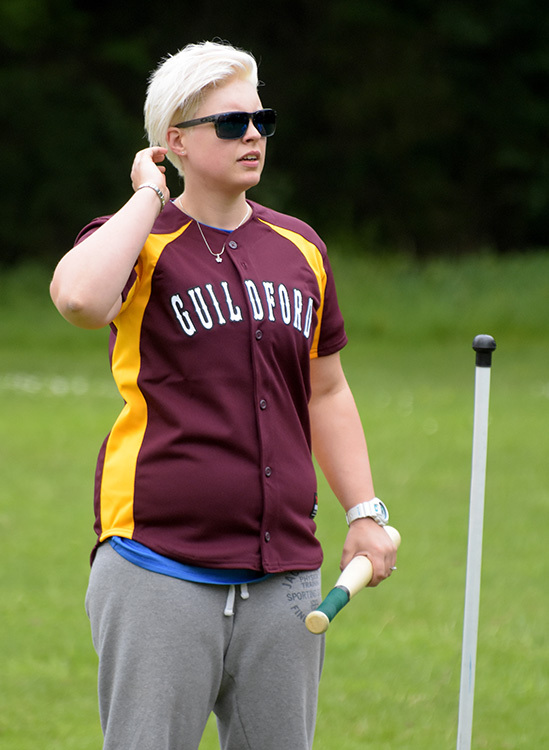 The Guildford Mavericks had a scheduled fixture with in Essex with Romford Wasps on Sunday 31th July 2016 but Romford were unable to field a team so the Mavericks were handed 9-0 forfeit victory. 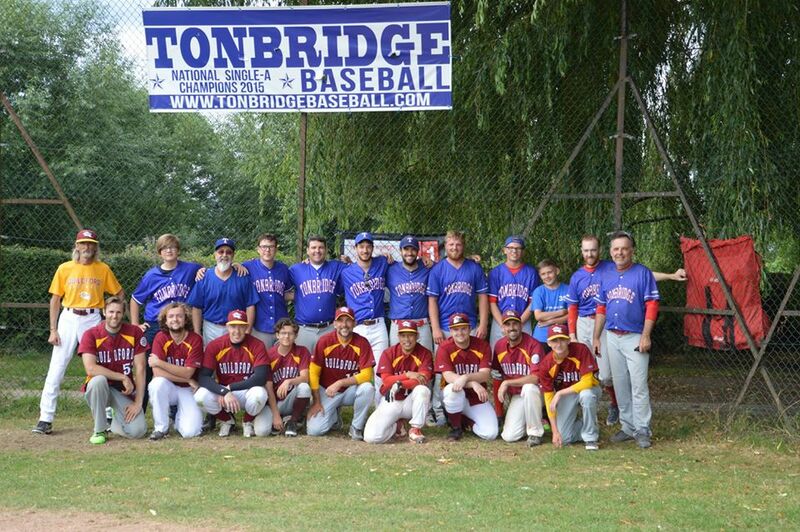 The good news is that Tonbridge had a weekend off and the two managers, having met a few times during the season, we happy to arrange a friendly game where both teams, including juniors and those that just wanted more time on the baseball diamond, got the opportunity. 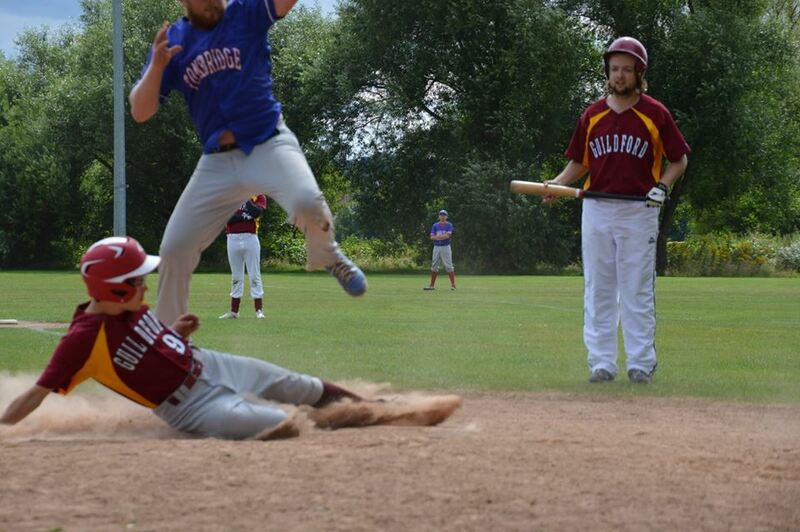 This speaks volumes to how far British Baseball has come in both Tonbridge and Guildford. Both teams played in the final of the Single-A Championships last year and continue to do battle throughout 2016 but both simply want to play baseball and both have missed 2 games at the hands of Romford this term and took the opportunity to get some more time on the diamond in a friendly atmosphere that allowed both teams to field youth players and players who are chomping at the bit for more experience and game time or to try out new positions. 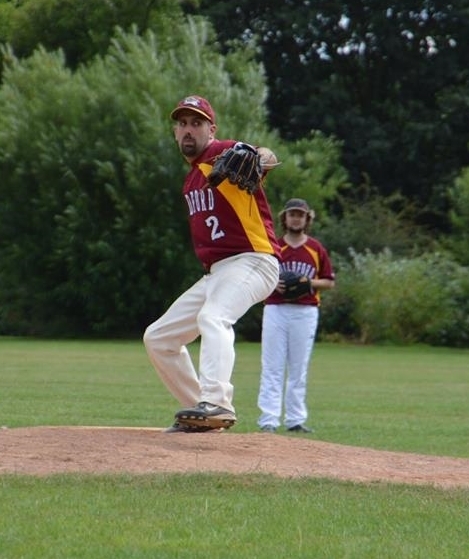 Guildford started strongly plating 3 in each of the first two innings whilst being equally strong on defence with pitching debutant Chris Ward on the mound allowing only 2 base runners. The highlight of the both innings was a stunning catch made by umpire-in-residence, David Jones, who was taking the opportunity to play left field this Sunday, to deny the Tonbridge clean up hitter. The tide turned in the 3rd with the Mavericks going down 1-2-3 and Tonbridge plating 3 runs of their own as the top of the order scored. Ward regained his composure and induced a ground ball from veteran David Mote before striking out the final batter of the inning. Moving into the 4th, Byron Thorne led off with a single, Ward took a walk and both came in to score on a line drive double from catcher Edgar Simbajon. In the bottom of the inning a couple of walks to lead off the inning would prove painful for Ward. As the lineup turned over, lead off hitter Laurence clubbed a 3 run home run to left field. Errors further compounded the inning with Tonbridge going on to score 5, leveling the score at 8 at the bottom of the inning. 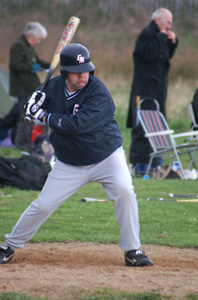 Signs of tiredness started to show from both teams in the 5th with 3 walks and two singles leading to 4 runs for the Mavericks and 4 walks, a hit by pitch, a 2 RBI double from Mark O’Hanlon and a single from Mote senior leading to Tonbridge taking the lead 12-15. Both teams made some minor changes and came out refreshed defensively in the 6th, Tonbridge allowing nothing but a single from Maverick debutant Finn Turbitt-Lewis and the Mavericks allowing only a Josh Miller single. The 7th saw a new pitcher on the mound for Tonbridge who struggled to find the strike zone allowing 7 walks and a couple of hits allowing the Mavericks to plate 7 overall with Dayne Turbitt taking advantage with a huge triple. Tonbridge went down easily again, Ward inducing a soft fly ball to left field, another to first baseman Turbitt and a strike out. 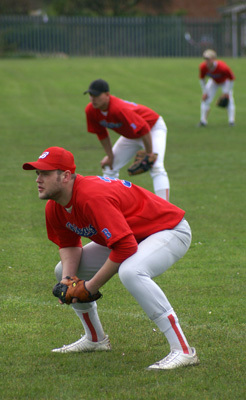 Brent Brakeboer, whose bat was getting hotter as the day wore on, hit a lead off single to start the 8th and some smart base running saw him score easily whilst rookie Finn Turbitt-Lewis was hit by a pitch, wore it well and went on to score on a close play at the plate with a superb slide to avoid the catcher. Brother Kane was next up but was not so fortunate in this inning, striking out which was the only time in the game he did not reach base in 6 attempts, great work by the Turbitt-Lewis brothers. The bottom of the inning saw 5 batters come to the plate for Tonbridge but none could come round to score after a couple of weak groundouts from the top of their order saw the end of the inning. The Mavericks now had a commanding 31-15 lead going into the bottom of the 9th. Ward was still on the mound with no other pitchers fit. A couple of walks and a single saw Tonbridge load the bases. Ward struck out the number 7 batter, walked in a run and induced a weak ground ball to first base to put the Mavericks one out away from the victory. Tonbridge manager Matt Styles started a two out rally with a cracking double before the final out was recorded with a ground ball to short where Kane Turbitt-Lewis coolly fielded and threw out the runner. The result of this game was completely unimportant, what was important was that at least 25 players got to play baseball on a beautiful English summer day. The Mavericks friendly with Tonbridge was a resounding success for all involved. 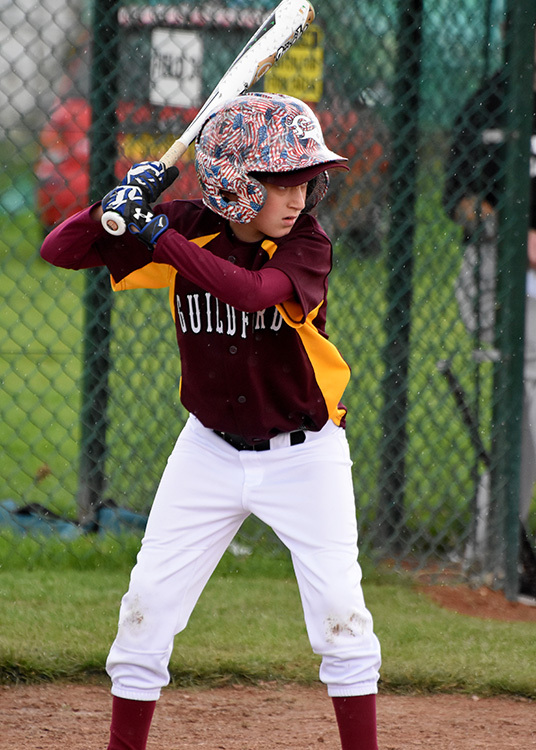 Guildford Baseball & Softball Club would like to thank Tonbridge Baseball Club for hosting a fantastic game played in the friendly spirit intended by British Baseball.